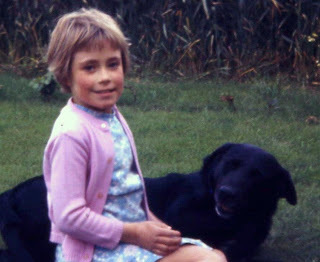 Hello out there in blog land , I hope your summer has been fun and eventful, in a good way that is. I have been very busy with one thing and another, crafting of course for different things, but more than anything decorating as we are putting our house on the market. It has a nice craft room for anyone interested!!! Bad blogger here,I have been a bit busy this last few weeks, so sorry I haven't been to see many of you on your blogs. 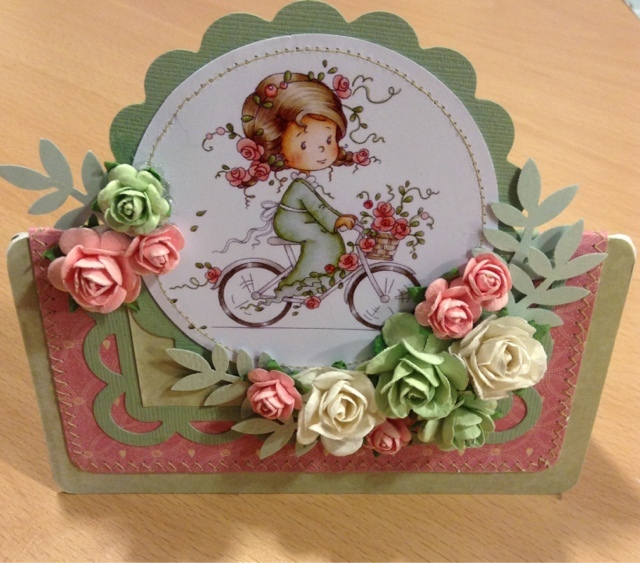 Just wanted to show you a card that I made on my last demo day at sir stampalot using the hobby house pre coloured image. I am back on the box tomorrow at 2 pm and HOBBY HOUSE have some gorgeous new items so if you have a few minutes pour yourself a nice cuppa and have a look. I can tell you there will be much fun and laughter as when we are together that's what we do. Here's a card I thought I would show you. I am sorry for not coming back to your blogs, will try my hardest next week. Today's the Day . HOBBY HOUSE ON CREATE AND CRAFT! Morning a bit of an early one here! Today's the day when I am going on TV for the HOBBY HOUSE, for the second time. I am very excited,though very very nervous at the same time. Come and see the amazing range of products the HOBBY HOUSE has to offer at 10 am. This is one of the cards I will be hopefully making if things go to plan. Morning out there and what a beautiful morning it is. The papers are first edition and called new leaf,this is my favourite love it. The sentiment is wild rosé studio. Just to let you know I will be back on create and craft on the 10th of may at 10am for THE HOBBY HOUSE for those of you that have been asking. Hello out there, hope the sun is shining where you are,it keeps popping out here for a it then hiding again. 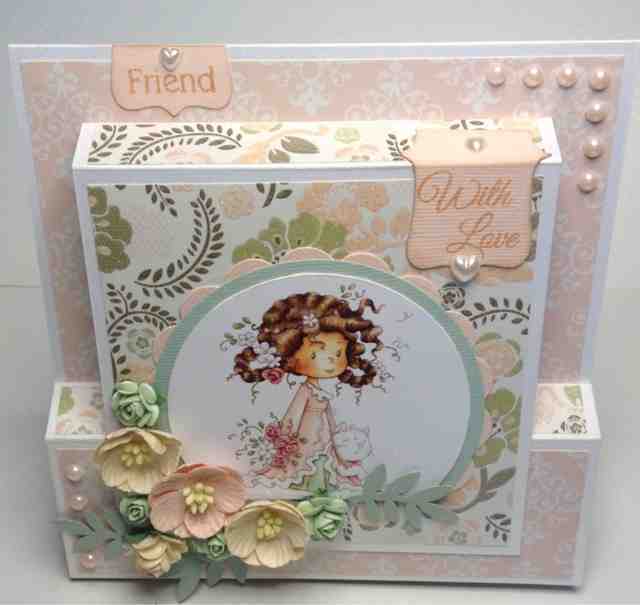 Here's a box card I thought I would show you using the Hobby House pre coloured toppers and flowers and of course there lovely papers. Wanted to thank you for all your lovely emails and support from Friday, I started to enjoy it half way through,now I can't wait to do it again! I know I am like a bad penny! Just wanted to show you something I have made using the gorgeous products from the Hobby House. Love working with them so very much. I will be back soon with some more soon,I won't leave it a year!! Promise! I have had a bit of a rubbish time just recently, not been gardening (It has got the better of me) as I have had a few days in hospital, I am meant to be resting but having a 12 year old in the house its not always that easy.we were going to do so much this summer holiday but it just hasn't happened . 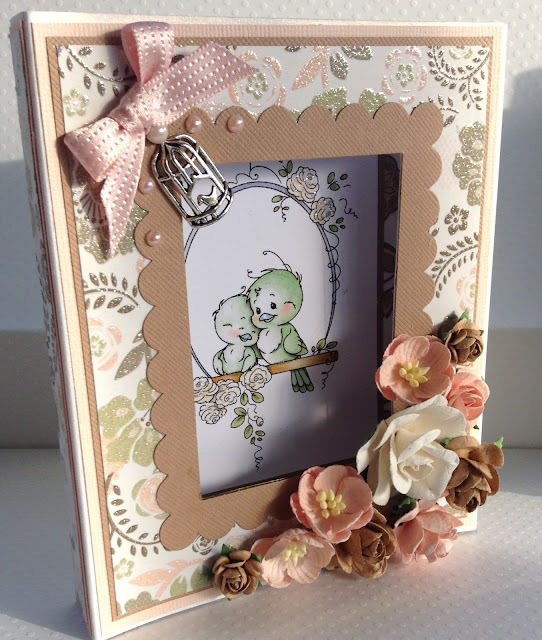 ...on to my card, this month at Sir Stampalot Challenge its a frame up, we want to see a frame somewhere on your project, so here is mine, the stamps are woodware, not sure what the papers are though. don't forget to pop over to the Sir Stampalot Challenge to see what the girls have been up to there. August Challenge with Sir Stampalot. A bit of what you fancy!!!!! Morning girls, it must be the first of the month again,here I am showing you my little card using and a bit of shrink plastic,and three versacolour inks, pinecone, split pea and lagoon blue, its my favourite combination at the moment, not a designer papers in sight. why not pop over to the Sir Stampalot Challenge blog to see what's going on this month, there is an amazing prize to be won, just check out the picture below. Here I am again like a bad penny, turning up just once a month at the moment, I am now decorating along side the gardening, so busy busy. 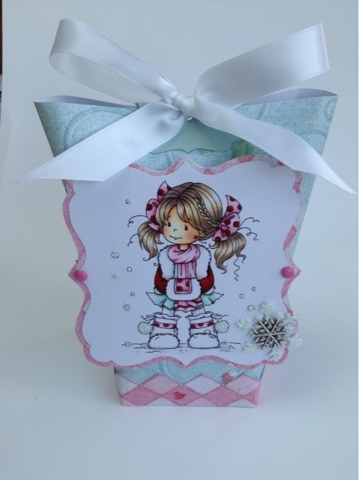 I have used a mini Molly here, they will be available Shortly ,I have to say they are right up my street as I like making small cards. so that's open to you all, go on, go on have a go. 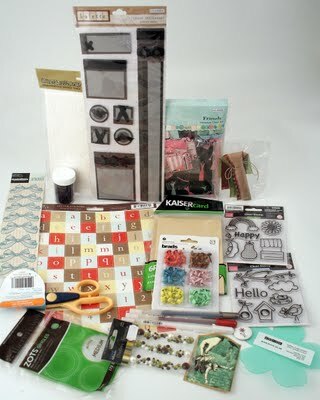 this is what you can win....... there are lots of Molly Blooms and other most needed stuff!! Don't forget to check out what's new also at Sir Stampalot. anyway its that time again, don't the months come round quickly, its Sir Stampalot Challenge time again and this month we want to see what inspires you from this picture here. I went with the natural feeling of wild flowers, lets see what you can come up with. hugs to you all and thanks for all your lovely comments. oh yes and a big Hi to Lincoln Lou, I will do more for this month I promise!! good morning, is it nice out there where you are, I do hope so. I do realise that I have been a bad blogger, but at this time of the year I have to be outside as we have quite a lot of garden that needs tending, I want to move, and have a bit less, but my boys are so happy here. 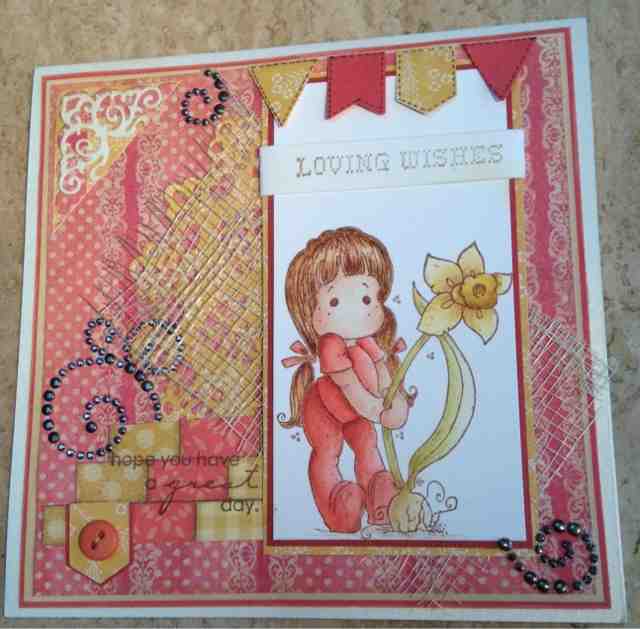 my card is made with lots of little stamps ( mainly hero arts) from various sets. the leaves are a nesti. and the flower shape is also a nesti. this month on the Sir Stampalot Challenge we want to see Magical worlds, don't worry it can be as simple as a butterfly like mine. oh yes and this is what you could win! do you remember last month over on the Sir Stampalot Challenge blog you had to work out who was who , well this was me at around 9 year old, I wondered if you guessed correctly. Hi there bloggers!! 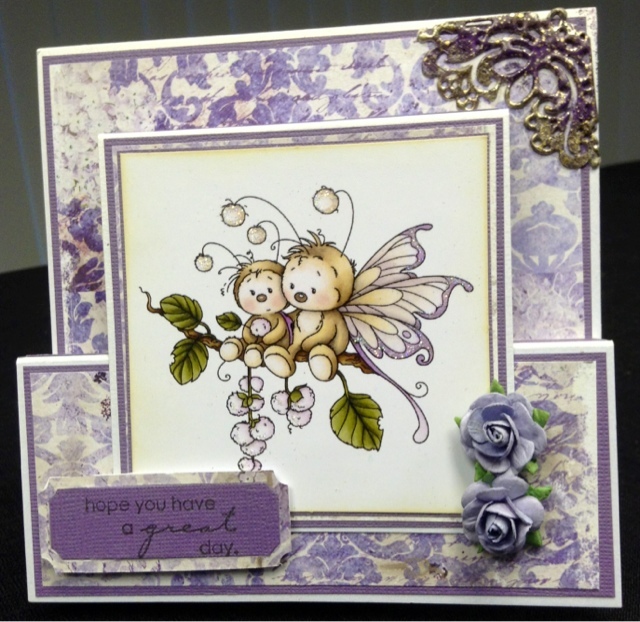 I am so excited, cause today, I am a special guest at A Spoon Full of Sugar Challenge Blog!! Thanks so much girls for the opportunity to be a part of this great challenge blog!! This weeks challenge theme is all creatures great and small, which is quite an easy theme for you girls out there. 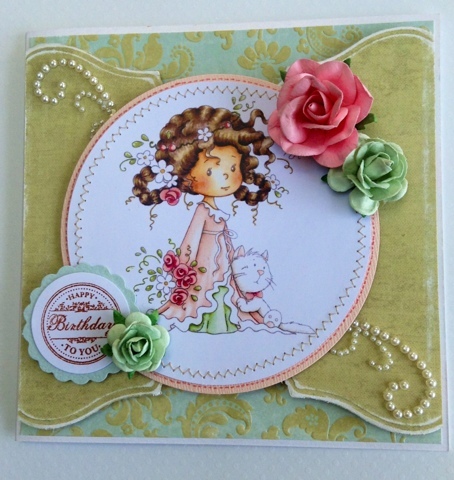 This fabulous challenge blog posts challenges every Tuesday and have some super prizes so be sure to submit your cards girls. hope you like my card,its different for me, saw the crackle glaze done at the NEC by jo and I just love doing it its so much . 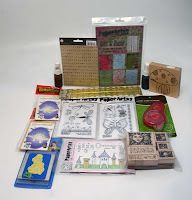 the stamp set is a crafty individuals which I bought from the NEC also. Happy Birthday to us!!! April Challenge with Sir Stampalot. It's the first of the month again and a bit of a special day for us here at Stampalot Challenge because it's out Birthday.........woohoooooooooo..........we are one year old today. Now as well as our Birthday it's April Fools Day !! So this means not only a brand new challenge, but we've also got something a bit special lined up with a twist or two. Click here to find out all about our Birthday fun. Thanks for stopping by to look at my blog. My name is Chris and I am 49 I am happily married to a very understanding Husband and have an adorable 14 year old son. I live in Lincolnshire on the East coast of the UK very much in the countryside. I am very fortunate to do demonstrations and classes for Sir Stampalot, and be on there design team. I am also on the design team for the Hobby House. thanks so so much for stopping by, if you leave me a comment I will come back and see you too.